Water-soluble vitamins are those vitamins that are dissoluble in water and excreted out of the body via urine after its use. These vitamins cannot be stored by the body, hence a continuous supply of water-soluble vitamins via diet, supplements or both is necessary. 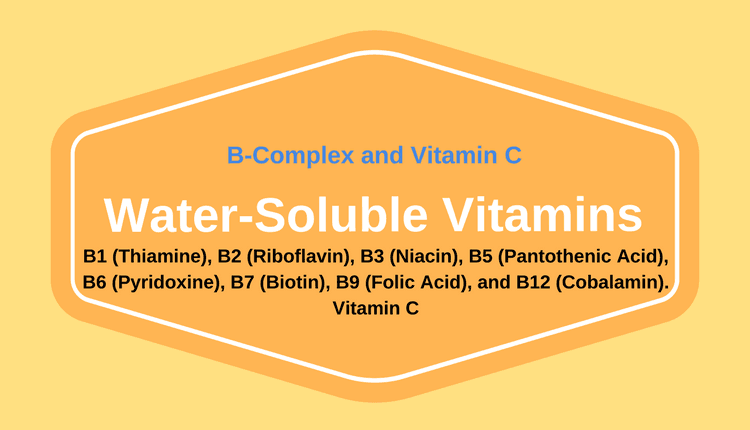 There are 9 different water-soluble vitamins, 8 B-complex vitamins, and vitamin C.
Vitamin B1 as the name suggests is the first vitamin of the B-complex group. It helps in converting carbohydrates, proteins, and fats from the food we eat into energy, which the body can use. It helps in maintaining proper nervous system functions and boosts normal appetite. The recommended dietary allowance (RDA) for thiamine for male adults is 1.2 milligrams/ day and for female adults is 1.1 milligrams/ day. The recommended dietary allowance for riboflavin for adult males is 1.3 milligrams/ day and 1.1 milligrams/ day for adult females. The recommended dietary allowance for niacin for adult males is 16 milligrams/ day and for adult females is 14 milligrams/ day. The recommended daily allowance for vitamin B6 for adult males and females is 2 milligrams/ day. The recommended daily allowance for vitamin B9 for adult males and females is 200 micrograms/ day. The recommended daily allowance for vitamin B12 for adult males and females is 1 microgram/ day. Vitamin C, also known as ‘ascorbic acid’ is a water-soluble vitamin which cannot be produced by the body. Hence, foods rich in vitamin C should be consumed daily. The recommended daily allowance for vitamin C for adult males and females is 40 milligrams/ day.